Ah, ok that makes sense. Yes, I still have the Vette's TPI dizzy, but I definitely wouldn't trust the module given its unknown history. I spent just a brief bit of time with it after work today. The upward bend on the driver's side of the hood is actually flexible - as I open/close the hood it wiggles pretty significantly, and I can see the underside is cracked in that location - so I may eventually need a hood. As I was backing it into our side yard last night, the power steering seemed to go out. So I checked it today & found it to be nearly empty. I topped it off & tried it, but I noticed even without moving the wheel there was fluid seeping out from under the reservoir cap(it's angled), so I ordered a new cap for it. The coolant in the radiator was just a bit low, and the reservoir was empty. I topped off the radiator & put a small amount in the reservoir just in case it leaks. The driver's door was pretty creaky, though fortunately it doesn't sag much. The other doors seemed ok, but I hit all the hinges with spray lithium grease while I had it out. I picked up a pair of calipers, guide pins, and pads from Advance tonight. It was probably a bit more than Rockauto after factoring in shipping vs. tax, but I also don't have to mess with shipping back the cores. The had the passenger's mirror glass in stock too, so I picked that up while I was there. I won't get to dig into the brakes until this weekend, but hopefully I can make it over to the courthouse to get it registered before then anyway. If they cross reference, I'd throw it in and see if it works. At least that way you can confirm if it's even worth keeping as an emergency spare. Otherwise you're just storing junk for no good reason. Did you spray the hood hinges too? Bent hoods usually involve sticky articulation points. Someone had already lubed the hood hinges, though I hit the latch. Bolt a reinforcement to the hood and make it last a year and i’ll bring one to challenge. Nice. I just picked up a GMT400 myself. Yours looks much less rusty though! I don't know about your area, but around here 400 sheet metal is cheap as dirt. Trying to find a hood that's not dented from bashing on it because the latch sticks is the tricky part. With a little luck/patience you can probably find a matching one with less terrible paint. Thanks for the offers & I may take one of you up on it! I also found one for $50 about 100-miles away, but I don't need it that badly yet. There would be a certain bit of irony in swapping TPI off my Vette, but onto my tow rig. Im not sure I've seen another one this shade of blue? Besides, as far gone as the paint is on the hood & roof I was thinking about hitting them both with a coat of white or silver sometime, just to cover the rusty spots and help with summer cooling. Just got back from getting it registered at the courthouse. Lifetime antique registration(with no restrictions), 1-time $75 fee. It wasn't a completely smooth process though. For one, despite the fact we're on the coast, they seem to really not understand people who have a dwelling here but are out of state residents. Since I don't have an MS driver's license, I knew I'd need documentation to prove residency, so I took a recent bank & mortgage statement. Unfortunately they only accept utility statements - SWMBO has the electric in her name, cable/internet is in our business name, the stub of our water bill that gets returned is the part with my name/address on it, and the gas bill is under Pete, not my first name(or first middle initial) like my driver's license. Fortunately one of my debit cards had Pete on it, so I was able to fill out a form authenticating I'm really me, and I pulled up a gas bill on my phone & emailed it to her while I was at the counter. I'm glad the office was empty when I walked in. Interestingly, being registered as an antique means they'll be mailing me a tag in a week or 2. So in the mean time I can drive it around without a tag. Between that and the 22's I'm wondering how far I'll get before they pull me over? Also, if the hood requires a "Fonz" to open, put a piece of 1/2" plywood under the hood spring by the catch. Every GMT400 I've ever been around had that issue. I discovered something on the truck today that I don't remember seeing on any other vehicle - the driver's seat has a foldable arm rest on the door side. Also, the power steering was acting up, so I got another bottle when I picked up the PS cap. I was surprised to find the fluid was full, but could tell in the light that it looks like mud. So should I attempt to flush the PS system, or is this a sign of an impending failure? Sign of impending doom. Usually the pump. Considering the flange where the cap seats is rusty, that's not surprising. I don't think I've ever changed a PS pump, any weird tricks to it or do I just swap it out, top it off, and cycle the steering back & forth to bleed it? Holy crap that interior is clean. Like, i can't believe that interior is in that truck levels of clean. And I've seen armrests like that, but only on full size vans. 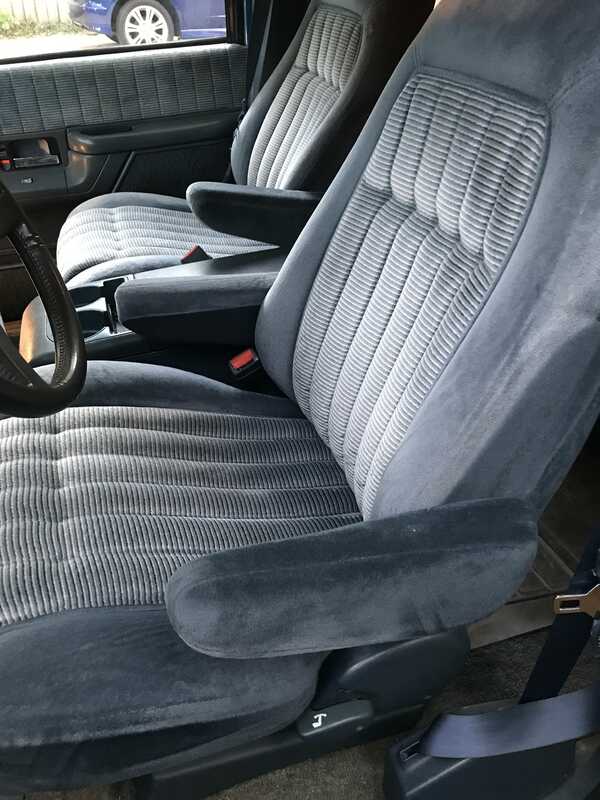 The carpets could use a good shampooing, and there are some stains on the seats that could possibly be cleaned, but no rips that I've found yet, and the headliner is in great condition too. Somehow the steering wheel isn't noticeably worn either. The power driver's seat is weird - all the electric controls are on the front of the seat. However I noticed while driving it today that the completely obliterated dash top is allowing the gauge cluster to flex and bounce quite a bit. I need to dig into it, but I'm hoping some aluminum flashing screwed/riveted/glued onto the existing pieces of dash might help stiffen it up. There's also a whirring that appears to be coming for the left side of the dash and correlates to engine RPM. I'm thinking it may be the tach, but I'm not sure if the stepper motor could cause that? I'll google it, I'm sure somewhere has asked that question before. Rockauto has PS pumps with reservoir from $30 to $50+(AC Delco). Is it worth $20+ for the AC Delco one? oh, and I had to stop somewhat abruptly today when a light changed, but the truck didn't pull to the right at all. So hopefully all it needs are the guide pins. I’ve had isn’t used cheap parts store p/s pumps. Rent the pulley puller. Now is the perfect time to change the two lines as well. I know they used to be stupid cheap($50 for the pair long ago). Also dibs on the seats and console if you crash it! Seriously. They would look nice in your truck. Cool! The last few evenings I've been working on my '89 Short Bed, Regular Cab 2wd that I picked up a couple of years ago. I plan to get historic tags for it tomorrow (while I'm in the capital city where I can get them on the spot rather than have them mailed to me). On the steering pump. I have that same serpentine setup on my (older body style) suburban and it's simple as long as you have the pulley puller (as mentioned above, just rent it from the store). I'll be following along to see what you run into on this as I'll probably have similar experiences. Tonight I replaced a winshield washer pump, took the cowl grille off to reattach a windshield washer hose (tip: don't use 100+ psi shop air to clear out your windshield washer lines, lol), and new wipers. 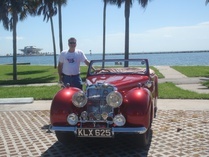 This past weekend I fixed the wobbly tilt steering column issue...THAT feels good to have accomplished! Very cool, we can trade old chevy horror stories! You know, I'm pretty sure the RPO codes show it has tilt steering, but it doesn't wobble at all!